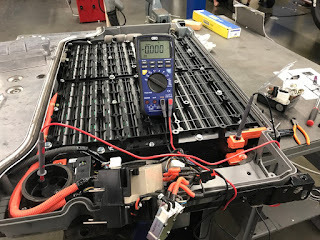 Here is a picture of Nick Rothman working on the Green Gears PHEV pack at Pat's Garage in San Francisco. Freddy Ortanez a tech at Pat's Garage and Lola the shop dog get ready to install a PHEV system. 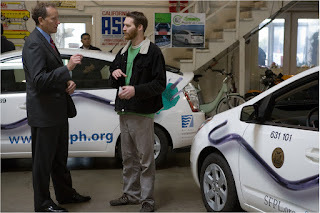 Pat Cadam of Pat's Garage and Green Gears (pictured right) and Lizzy Ames discuss PHEV pack.